My new craft room is almost finished, and I finally had a minute to whip out something fun to decorate my still-bare walls. This stylish DIY project takes less than 30 minutes to create and costs next to nothing, but will add a ton of personality to your work space! The view from straight-on looks just like any other (decoratively shaped!) 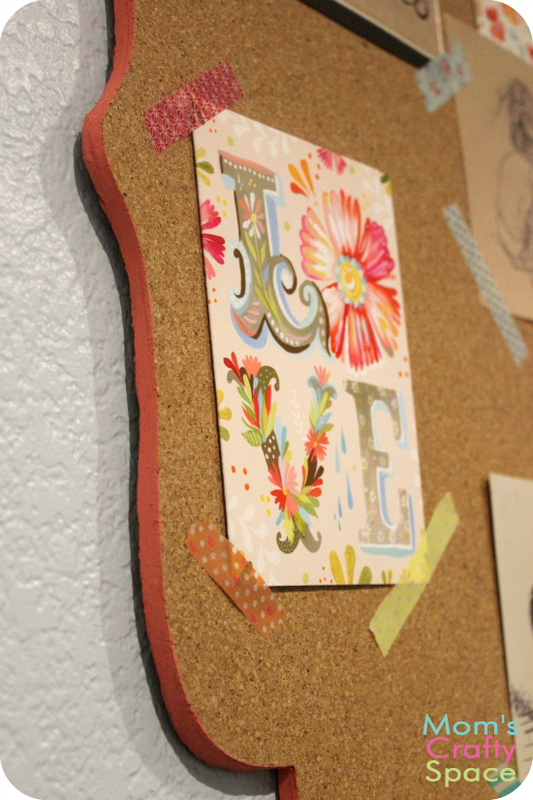 corkboard, but from the side you get to see another layer of personality with a bright pop of color. You can match your decor for a subtle hue or choose a neon bright shade to really add some pizzaz! 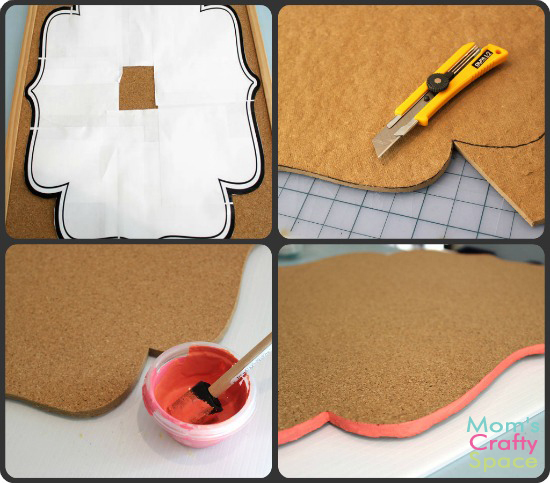 Print out a template to fit your corkboard. If you happen to have an 18×24 corkboard you can download my template here. You’ll need to choose the “poster” option in the print menu and tape the pages together. 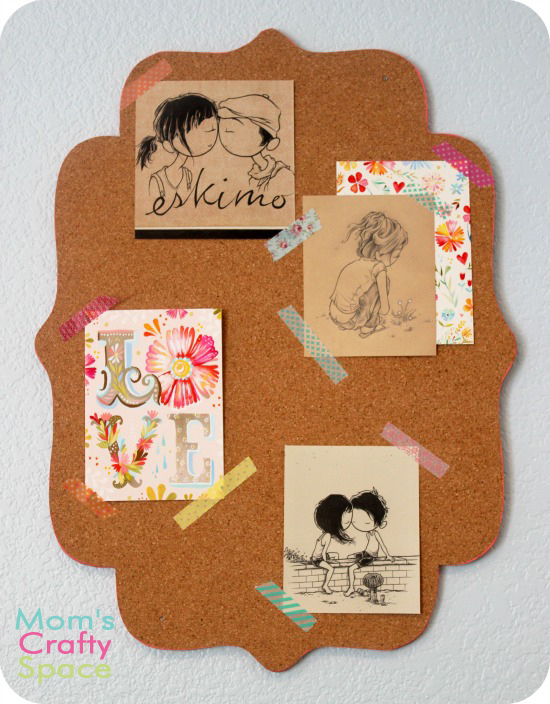 Remove the frame from your corkboard and trace the template on to the back side. Use a super sharp utility knife (this one by Olfa absolutely rocks!) and cut out your design. It will take a few passes of the knife to cut all the way through, so it helps to work in small sections, removing the excess as you go. Choose your accent color (I used acrylic craft paint) and paint the edges. It will likely require a few coats of paint since the cork is so absorbent. Super easy, totally chic and a great way to spice up your office space! My corkboard is the first thing I see when I look up from my desk, so I covered it with inspiration from a couple of my favorite artists (Katie Daisy & Kurt Halsey) and colorful washi tape. Hi. I’m visiting from the Happy Hour Projects linkup party. 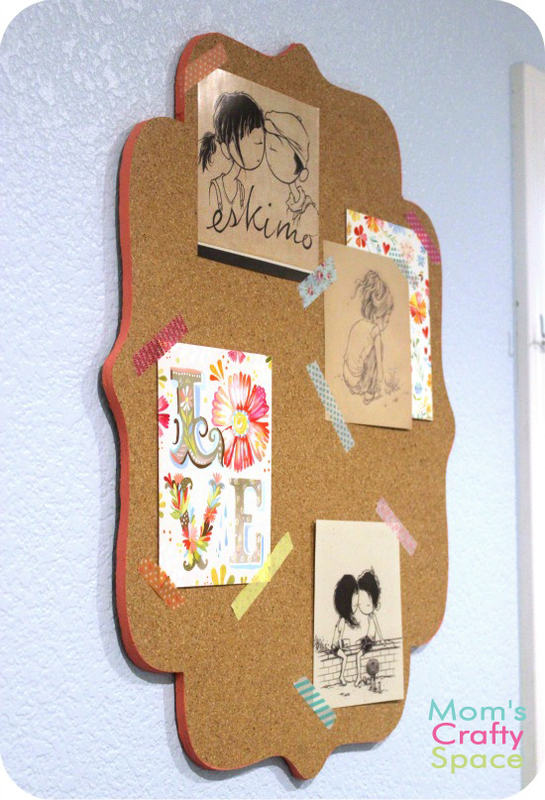 This is a great transformation of an ordinary cork board – I love it! Great idea!! !